In fashion drawing, you’re either copying something that’s already been designed — drawing something you see on the street or runway — or designing a garment as you draw. Either way, you’ll discover endless style variations. Remember that there are many more shirt types for you to copy or create! The difference is in the details. Topstitching, thread stitched on the fabric that’s visible from the outside of the garment, adds much of the detail in shirts. Topstitching on shirts is mostly decorative; when you draw pants, you may also use topstitching, but it can be decorative or functional (to attach pockets, for example). On shirts, you commonly see topstitching around the neckline, the hems of the sleeves, and the bottom hem of the shirt. Draw in two rows of small dashed lines around the hem of each sleeve, following the curve of the hem. Shirts almost always have two rows of topstitching here because of the type of stitch used to finish the sleeve. Move to the bottom hem of the shirt and draw a row of dashed lines following the curve of the hem. 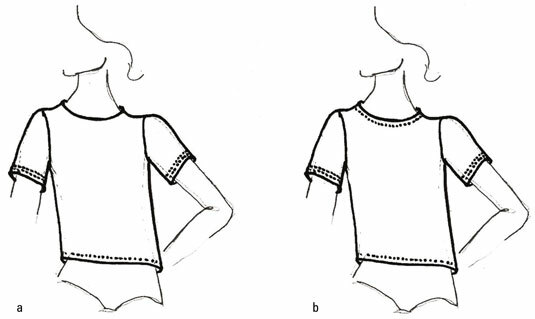 Finish the shirt by drawing a row of dashed lines around the neckline, following the curve of the neck. Different fabrics lend themselves to different styles of shirts. One way you can distinguish a dressy shirt from a knock-around tee is by the fabric each shirt is made of — the fabric choice leads to different methods of construction. You may not be actually sewing your designs, but someone will be. And then a model will have to put on your garment, so keep the construction aspects in mind. A shirt made of knit fabric stretches. Knits are made by looping a continuous strand of thread or yarn back on itself. If a shirt stretches, you just pull it over your head. There’s no need to put buttons and a front placket (the type of opening used for shirts that open at the center front) on a stretchy shirt . . . although a knit shirt may have them! You need fewer lines to draw knits, and they may have a less fitted look. Shirts made from woven fabrics usually don’t stretch. Woven fabrics are made by interlacing two sets of thread at right angles. If the fabric doesn’t stretch, then you can’t pull it over your head, so you need to give your model another way in and out of it, such as a zipper or buttons. The fact that you can just draw it on her without her lifting a finger is immaterial! Garments made of woven fabrics also have seams to improve the fit. Most shirts made from woven fabric open in the front, because an opening on the back of the shirt would be hard for your model to put on — not that that stops some fashion designers from creating such designs. Shirts made from woven fabrics can have a variety of collars or just simple necklines. You don’t use a specific type of drawing line for knits and another for woven materials — a trained designer’s eye can pick out clues about the fabric from the seam placement and fit. In a drawing, showing exactly what type of fabric your model is wearing isn’t always easy. You can give other hints about the type of fabric through details such as texture and draping (how the fabric hangs on the body). How a shirt is cut and put together can completely change the look. For example, a shirt with an opening down the front is generally dressier than a pullover shirt. And the cut of the armholes, sleeves, and cuffs can make a shirt look casual or dressy. A puffy, flowing sleeve has a dressier look than the straight sleeve of the tee or a sleeve with the ribbed type of cuff you normally see on sweatshirts. But make the shirt out of silk and put a long row of buttons on the cuff, and you’ve created a dressy shirt. The varieties are endless! Yokes: Yokes, which you often see in Western style shirts, are seams that create fit and style in the chest area by the shoulders. Yokes can appear on the front or the back of a shirt or blouse, and they’re suitable for women’s or men’s shirts. Gathering: Gathering is any part where fabric is bunched together. Sometime it’s on necklines, sleeves, or hems. You most often find this detail on women’s tops. Lacing: Any type of shirt can have lacing. It can be functional, such as to make the top super tight, or it can just be for looking cool. 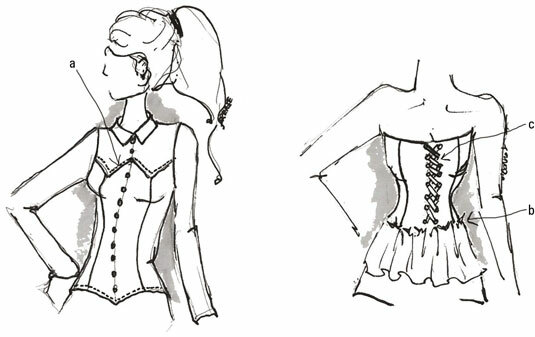 You can put lacing on a man’s shirt and go for the Renaissance look, but lacing is generally found on women’s clothing.